Now that summer’s here there are more events to attend than ever and we’ve got a list of some of the most exciting ones going on in the Bay State this month! Cape Harmony – Cape Harmony is Cape Cod’s newest a cappella group and they have some serious talent. This all female singing sensation has been featured on various radio stations, performed with Livingston Taylor and the Air Force Academy Band, performed for thousands of fans at concerts, festivals, private parties, nursing homes, schools, fundraisers, and parades. With a repertoire of songs covering artists such as Michael Jackson, Billy Joel, The Beatles, Jason Mraz, Jessie J, Fleetwood Mac, Boyz II Men, Miley Cyrus, and many more, there is something for everyone to enjoy. They have multiple shows every week and mainly play at local churches but also play larger events as well as private ones. Make sure you take some time to enjoy one of their performances this summer, you won’t be disappointed! Brockton Rox – This is the perfect family event to bring the kids to this summer! Watch the Rox baseball team play at Campanelli Stadium in Brockton and enjoy a night under the stars watching America’s favorite pastime. Kids will love the many activities they have for them, as well as the entertaining sumo wrestling during the 7th inning stretch! Other promotions include $2 beers on “Thirsty Thursdays”, 3-D fireworks, kids run the bases, trivia, and different theme nights including “Christmas in July”, country night, beach night, and many more. There are also giveaways before the game and kids can get autographs after the game. Definitely head to Brockton for a game this summer if you get the chance! 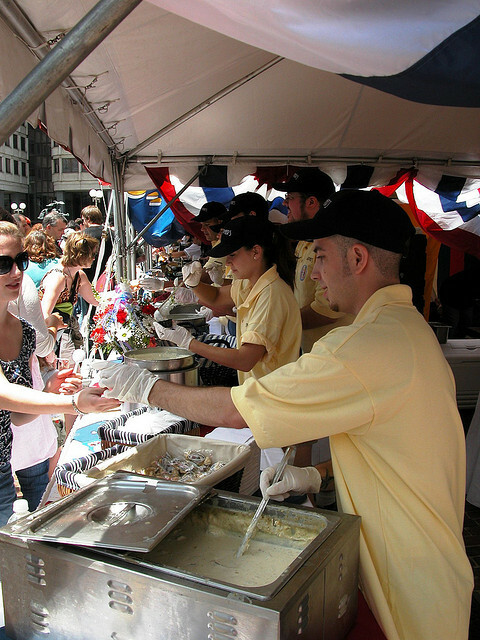 32nd Annual Chowderfest – Chowderfest is one of the most popular staples of the Harborfest celebration in Boston and as you may have guessed, there will be tons of chowder, in fact, there will be over 2,000 gallons! Stop by Boston City Hall Plaza on Sunday, July 7th from 11 AM – 6 PM for all the chowder you can eat! Tickets are $13 for adults and $9 for children (age 12 and under) and participating restaurants will be competing for the title of “Boston’s Best Chowder” which they will only get if they receive the most votes from the crowd. Participating restaurants so far include Anthem Kitchen and Bar, McCormick and Schmick’s, the Hyatt Harborside Grill, the Chart House, and more to come! Lowell Folk Festival – This yearly festival is so popular it draws a crowd from all over the country. This free festival is the largest of its kind in the United States and features a variety of folk musicians performing throughout the weekend. There will be blue grass, gospel, folk, polka, country, Irish, Dominican, Portuguese, and Greek musical performances just to name a few. In addition to the lively music, there will also be ethnic food available as well as CD’s, crafts, and other items for sale. Don’t miss your chance to enjoy some live music, take in the great outdoors, and maybe even try something new to eat! The festival will be taking place from Friday, July 26th – Sunday, July 28th. As always, there’s an event for every member of the family to enjoy so get your tickets while you can and don’t miss out on any of these fun summer events!